It's Wednesday morning at the North Berkeley Senior Center and twangs of country music might make you think you're in a friendly down-home bar in Texas. Not so. Instead, Asian-Americans of Chinese, Japanese and Korean heritage -- all over the age of 60 -- are learning Country and Western line dancing. Everybody is doing quite well and looking very cool. One of them is wearing cowboy boots. Across town at the South Berkeley Senior Center, six foot-something Chinese-American, David Wei is teaching Tai Chi to a room of elderly African-Americans and white folks who've come together to learn physical balance and an Asian meditative approach to well-being. At the end of the session everybody chants "ommmm." Berkeley has long been one of America's most dynamic communities where cultural diversity and a sharing of cultural practices is the norm. And in 2014, Business Insider said it was still the most liberal city in California. "Berserk-ley" is what some of us called our city in the 60s when we were young and living the carefree life of protracted adolescence. We smoked weed, protested against the Vietnam War, experimented with New Age belief systems, supported the Civil Rights Movement and later the Anti-Apartheid Movement's Divestiture Campaign. We pitted ourselves against "the machine" as Mario Savio called it. A visit to the campus Free Speech Café reminds us of the poetic power in this 1964 speech since the entire text is hanging on the wall, available to anyone waiting to pick up a latte or cappuccino. The Free Speech Movement is celebrating its 50th anniversary and apparently not much has changed. Not everybody who lives in Berkeley is a liberal but the majority is. The current classification as used by Business Insider is determined by one's allegiance to the Democratic Party and a preference for secularism. Other liberal attitudes include a relentless concern for social justice that is reflected in one's personal politics about gun policy, climate-change, abortion, minority rights - be they racial, cultural or gender related - and lastly but arguably most important, "the government" and its role in collecting and re-distributing taxes. Ever since the Free Speech Movement of the 60's, Berkeley has attracted freethinkers who want to challenge the status quo. Berkeley is not alone, of course. There are other university towns scattered across America that are socially liberal, politically progressive, intellectually rigorous and prone to a high degree of hedonism such as Boulder, Colorado; Ann Arbor, Michigan; and Madison, Wisconsin. But Berkeley is where I went to graduate school and where I chose to live for over 20 years. Although I moved to Europe in 1991, I visit Berkeley and every time I do, I fall in love all over again. Where else do you find elderly African-Americans learning Chinese body movements? Or senior Asians learning to slide and move to Billy Ray Cyrus? Where else can you find a first rate community chorus that doesn't require an audition to join, yet so skilled, disciplined and accomplished that it performed Dvorak's Requiem in, not just Berkeley, but Prague? Where else, indeed, is there a waiting list to take an academic course on tax reform? Every Friday, Cal's Wheeler Auditorium is filled to capacity to hear Prof. Robert Reich challenge the status quo with his course on "Wealth and Poverty in America." Over 800 people are formally enrolled with 100 or more that are willing to stand up for 90 minutes just to hear this man. Reich is the American political economist, author and commentator who was Secretary of Labor from 1993 to 1997 under President Clinton. He wants to save American capitalism from its current condition in which 1% has a monopoly of control. Reich doesn't believe in redistribution of wealth for its own sake. What bothers him is how 99% of Americans can afford to pay for what we require to be safe and productive. He is not "a class warrior," he says but "a class worrier." According to Reich, America's super rich do not pay their fair share of taxes and this has to change since taxes are the price we pay for a civilized society. Tax Reform and fairness. This is his agenda. The first time I audited his lecture, I thought: "Inequality? OK. But tax reform? ... boring! Hummm, evidently not. The room is packed! Listening to Reich talk truth to power, I decided, was a very Berkeley thing to do. Another Berkeley thing to do is to eat well. My generation took a vow of simplicity and anti-materialism so it never fails to astonish me when I visit to see how much Berkeley has surrendered to hedonism. It stared with the food revolution and supporting local produce. Today, North Berkeley is synonymous with great, simply spectacular eating. The Gourmet Ghetto is birthplace to Peet's coffee in North Berkeley's Walnut Square on Vine Street near Shattuck Avenue where The Cheese Board makes the best scones in Northern California. And Chez Panisse? It's still there - where it was founded in 1971 - just across the street in the unpretentious brown-shingled house where Alice Waters invented California cuisine. Around the corner on Cedar Street, there is a tiny (may I say teeny tiny) take-away named Grégoire. Here you can get dazzling stuff to eat and unless you carry it home or to your workplace, you'll eat it sitting on the sidewalk or maybe (if you're lucky) at one of only a few picnic tables. This too is very Berkeley because - in the face of current world events - living well is the best revenge. Take breakfast, for example: a box of assorted just-out-of-the-oven pastries ($6.00); duck confit & potato hash with poached eggs ($10.95); or a baked puff pastry with scrambled eggs, bacon, caramelized onions and jack cheese ($9.75), both served with roasted potatoes and shallot cream. Grégoire claims to be the Bay Area's finest take-out and he might be right. "Everything I offer," he writes on his menu brochure, "is meticulously prepared from the finest natural, organic and locally sourced ingredients." How Berkeley can you get? After breakfast you can get some exercise by walking up Cedar until you get to Euclid Avenue. Make a left turn and walk five minutes to the stairs that take you to Rose Walk. 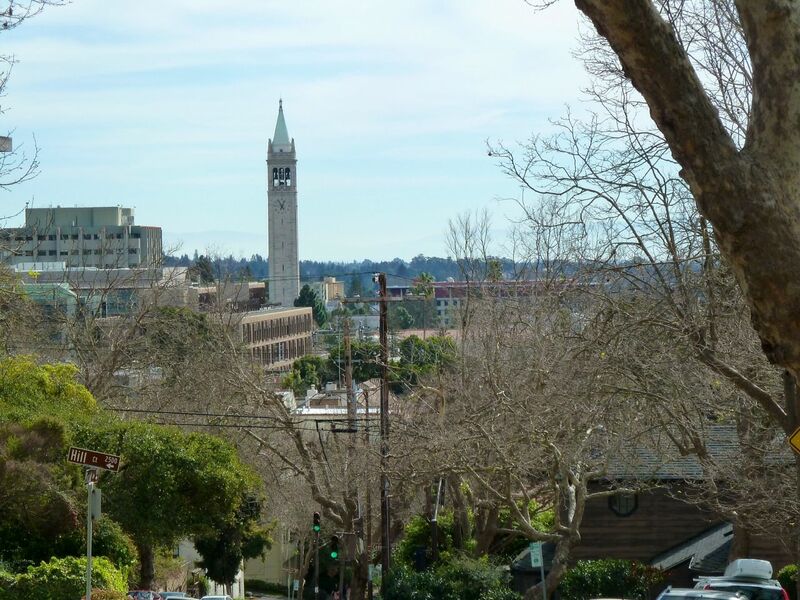 Stretching between Euclid and Le Roy avenues, this is one of the most celebrated paths in the North Berkeley Hills. Beyond that there are the La Loma Steps. The neighborhood is a living museum of remarkable Berkeley homes designed by some of architecture's most celebrated designers, including Bernard Maybeck, John Galen Howard and Julia Morgan. If it's a Sunday afternoon, you might hear music coming from the dwelling at 1537 Euclid on the corner of Buena Vista. This is one of Berkeley's best kept secrets, the Maybeck Studio for the Performing Arts. The interior is pure Maybeck with near perfect acoustics and a seating capacity of just 40. What's "Berkeley" about all this? To begin with, this sensational home is privately owned without any legal obligation to share it with the public, yet it is. Why? Because it's a friendly thing to do - or as the current owner says - "sharing it is worthy of the house." It turns out that during the rest of the week, the performance studio is the owners' living room but on Sunday afternoons, it is allocated to others: total strangers, like-minded music lovers, people attracted to magic spaces. Attending a performance in this room is close to a sacred experience but not of the religious kind. "Kinship" is what one feels, an almost palpable sense of community through shared values. And that's why Berkeley is an oasis.